When you read the words “zombie apocalypse,” you probably think you’re in for a gory fright-fest. 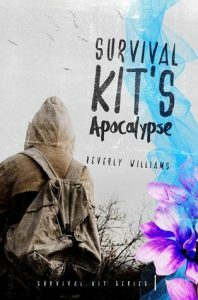 But Beverly Williams’ post-apocalyptic novel Survival Kit’s Apocalypse is less about the horrors of its zombified world and more about the exquisitely personal terrors of trauma—and the relationships that can help heal them. In this character-driven novel, the titular heroine Kit is fleeing both from the novel’s zombies (called “rotters,” a mostly standard interpretation of the classic monsters, albeit with hints at a twist in their origins) and from a hideously violent past. Almost preternaturally capable but psychologically stunted, as a protagonist Kit is relatable if not quite likeable. Her past traumas are treated with sensitivity and humanity by the author, but are still quite disturbing to read about as they are revealed slowly throughout the novel. The physical and emotional scars of her twisted upbringing are excavated through the relationships she develops when she arrives at a camp of survivors. There, she is drawn out of her shell by survivalist heartthrob Eric and his brothers Thom and Matt. The siblings also come from an abusive household, so they can relate to Kit as she struggles to not only live in this new world, but to thrive and belong. Scenes of head-popping rotter encounters and survivalist tactics are interspersed with slower, more nuanced set pieces in which Williams deftly develops the relationships between Kit and the other survivors, using quotes from favorite songs and authors to organize the scenes thematically. In addition to Kit’s struggles with self-harm and thoughts of suicide, she also experiences moments of joy as she develops her first-ever romantic relationship with Eric, finds a new friend after saving the meek but resilient Sam from her abusive boyfriend, and begins exploring what happiness and family might look like in the aftermath of societal breakdown. As the camp members realize that the rotters are not the only threat they face, Williams brings home a central theme: humanity can be more monstrous than any supernatural creature. While there were moments when I would have preferred greater emphasis on pulse-pounding action and fright over deep-thinking exposition, Survival Kit’s Apocalypse is ultimately a page turner which is deeply invested in its characters, and as a reader I couldn’t help but worry about Kit and her strange, eccentric new family. Although I came into the book expecting a thrilling tale of terror, in reality it is a surprisingly subtle parable of hope, home, and healing. Survival Kit’s Apocalypse: Survival Kit #1 by Beverly Williams. Published 2017 by Curiosity Quills Press. 366 pp.